Performing security assessments of complex systems sometimes requires some technical gymnastics to “man-in-the-middle” (MITM) communications between components. MITM techniques are essential for observing and manipulating communications in ways that a developer may not have anticipated. As system defenses improve the task of setting up a MITM environment for a system becomes more difficult. A recent assessment was a bit more challenging to MITM. This system required the critical authentication steps to be sent over the cellular network. Usually we will MITM cellular devices over WiFi but enabling WiFi resulted in Android sending _all_ communications over WiFi including the critical authentication step. BURP for inspecting and manipulating traffic. Eventually I wrote a functioning exploit using mitmproxy which is perfect for Python scripted traffic manipulation. 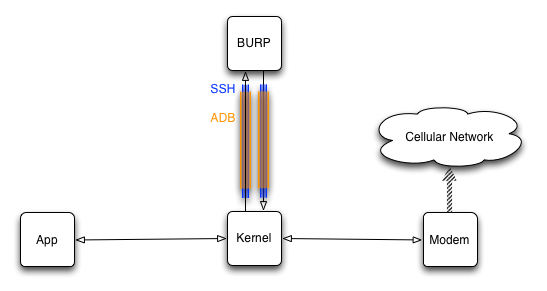 SSH (shown in orange) to function as a tunnel to BURP and a SOCKS proxy for traffic leaving BURP. ADB (shown in blue) to provide a non-WiFi connection between my Mac and the target device. ADB carried SSH traffic over a “forward” tunnel to the device. iptables scripts on the target device to send packets into this contraption as required. 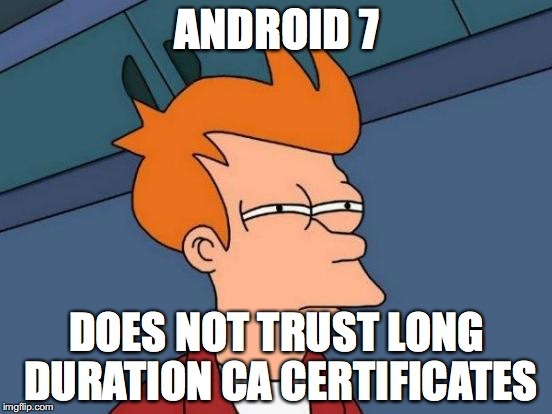 The first task was convincing Android 7 to trust the BURP CA Certificate. The standard CA Certificate has an expiration date so far in the future that Android simple rejects the certificate. You must make a new certificate, add it to Burp, and then add it to Android. # Make PKCS#12 file for burp import. echo "You must have a password or else burp will not import it." echo "Install this certificate to Android: $CERTFP.0"
echo "Import this certificate+private key to Burp: $KEYNAME.pkcs12"
Enable transparent proxying. This is required because our iptablesrules rudely shove packets at BURP without establishing a proxy connection. A proxy connection would explicitly inform BURP where the connection is intended to go. Without this hint BURP has to infer this from parsing the HTTP request. Import your new shorter duration CA certificate. In Project Options -> Connections configure BURP use localhost:37760 as the upstream SOCKS proxy. This sends traffic from BURP back over ADB+SSH and then out over the cellular network. You’ll need root access on your target device. You’ll need a real SSH daemon on the device so that you have a reliable SOCKS proxy. There are various apps that provide proxy services on Android but I’ve found good old SSH to be the most reliable. You can easily install it using Termux. cat > .ssh/authorized_keys then paste your clipboard. Now Control-D to terminate cat. Fix permissions on the .ssh/authorized_keys file so SSH is happy. It does not matter what user account. You’ll always end up the Termux user. Disable WiFi on the target device. When you turn off WiFi you’ll lose the ability to SSH into your device unless you can tunnel over ADB. You must have a recent version of ADB for this stuff to work right. Tunnel from the device to BURP over port 8080. Proxy requests over SOCKS from the Mac to the device so that you can use the device’s cellular connection. Just because you have these tunnels does not mean that any traffic will be sent over them. You’ve got to mangle iptables rules to redirect traffic over the tunnel. The example below is only for IPv4 because ADB seems to only be able to forward IPv4 traffic. The systems I’ve tested have been dual stack so I fixed this by adding the IPv4 address for the server to /etc/hosts on the device. This forced the usage of IPv4. You could also handle this by using socat to tunnel IPv6 to IPv4 but I did not try that. Anyways, adapt the script below and run it on the device as root to start using the tunnels. # Android username for the application that you are hacking. # be sent to burp. # Android username for the sshd process. Run `ps|grep ssh` to find it. # not owned by SSH to the burp chain. curl -v http://google.com. Check in Burp for traffic. curl -v https://google.com. Check Burp. TLS cert should be the one you created. curl -v http://ip-api.com/json. You should be on the cellular network. Next run your target app on the device and make sure you’ve got Burp traffic as expected. You can inspect Chrome running on your Android device over ADB.